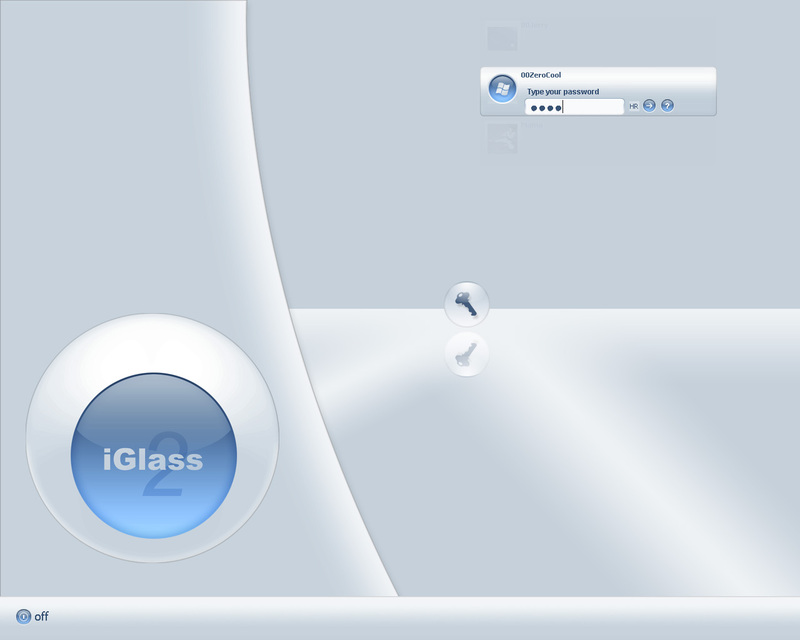 Made to match iGlass 2 WB Skin. You just need to double-click the iGlass 2.logonxp file! Logon Studio will open and skin will be instaled ! If that doesn't work rename the file to iGlass 2.zip and extract the files into Logon Studio skins folder. For more info open the logonstudio help. No offense to your work, but for selecting users and having the selected user move up, the animation isn't as smooth as the standard windows logon. Can you by any chance make them smoother? igloo0213 I can't change that ! Sory ! I'm gonna try to re-install LogonStudio. Maybe that will fix it. When I deleted my account and logged on as my new one it was smooth. I don't know what's going on. What is the meaning of "value creation failed at line 365."? aking, I think that you have made a change of bmp picture(s) into 00Zero Cool logon, for exemple, you have replaced a bmp with another size. I see nothing else. 00Zero Cool. Can you make this logon just a little cleaner? Its a little confusing with the screenshot of your destop mirrored onto itself. If you could remove that it would be great. Frankly, I can't help but enjoy this. Well done, 00Zero Cool! Does it work for WinXP SP1?? Sorry 00Zero Cool, but this logon isn't one of my favorite logons. Can anyone recommend an alterantive logon? If you can, please post a link. It said" value creation failed" at line 14"
And thanks to 00Zero Cool for getting rid of the desktop reflection. �Set the logon screen in style xp to default win xp screen (if that is possible, I don't know because I don't have style XP), restart your PC and then turn Logon Studio on!